We’ve all asked or answered these questions and, when combined with other quantitative data collected about training and recovery, they can provide valuable insight into how any athlete is responding to training stress. 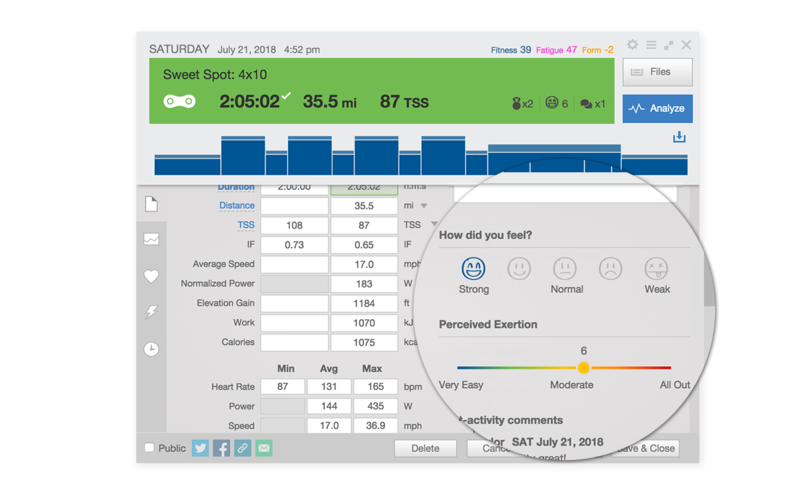 Now when you view a workout in TrainingPeaks you will now have two options to leave subject feedback. “How did you feel?” gives you a choice of five face icons representing a range from “strong” to “weak”. “Perceived effort” allows you to indicate how hard a workout seemed on a scale of 1-10 (this option is similar to asking how the workout went). While these two new additions may seem similar, each provides different information, and when interpreted together can give valuable insight. For example, after completing the first easy workout after a high volume block of training you may rate the Perceived Effort of the workout as a “3”, indicating that the intensity of the workout did seem easy. However you may have also felt fatigued, inefficient, or generally “flat” so you rate How you feel as “weak”, indicating that you may need more recovery. Likewise, you may complete an especially difficult workout or training race and rate the effort as a “9”, but that you felt “strong”, which means you are tolerating your current training load well. It is tempting to associate Perceived Effort (PE) and Intensity Factor (IF). It might seem like a workout with a 0.60 IF should be perceived as a “6” on the PE scale, for example. However, this isn’t always the case; a 6-hour, 300 TSS hilly bike ride may have an IF of 0.60, but if you aren’t used to workouts that long it might feel like a 9 or 10 PE. The new subjective feedback ratings can be useful for coached or self-coached athletes. No matter how data-driven you or your coach may be, subjective feedback can place your quantitative data in context and help guide future training. The new subjective feedback scores can also quickly indicate how your everyday training is going. You can save comments for important workouts that may require more detail or communication. Coaches will see benefits from these new feedback ratings as well. Athletes can now provide important information with just two clicks, so they no longer have an excuse to not leave some sort of feedback—and coaches can spend less time reminding them to leave comments on their workouts. On the other end of the spectrum, more verbose athletes can express themselves easily with these ratings on day-to-day workouts, and can save their essay (or novel) writing sessions for really important workouts or races. Once you (or your athletes) get in the habit of using the feedback tools, you can start spotting patterns and adjusting training earlier and with less effort. These won’t be the type of metrics that you need to precisely track and analyze over time. Instead, you can think of them more as warnings or alerts that you may need to look at something more closely. For example, if an athlete leaves a frowny face for the first time in 5 weeks on a workout that they normally have no problem with, they may require a little more attention to make sure they aren’t heading towards injury or sickness. Or if you never rate anything more than “5” and always feels strong, it may be a sign you’re plateauing and are ready to handle more or harder training. 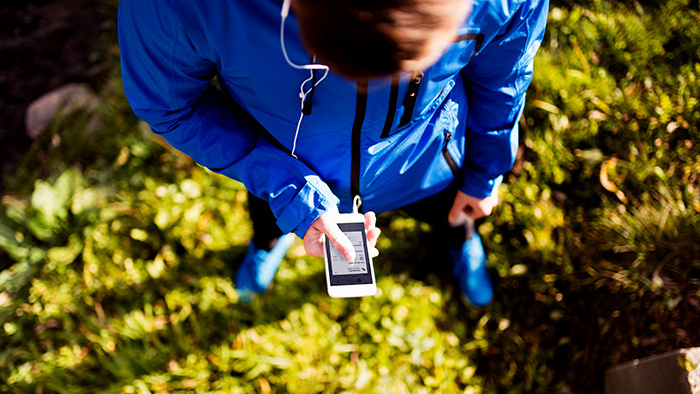 You may be surprised at how quickly subjective feedback becomes a vital part of your training routine. Cody grew up racing mountain bikes in Durango, Colorado where he developed a passion for endurance sports, science, math and technology. He switched to the road and track while racing for Fort Lewis College, where he also managed to get a couple of science degrees. Now he gets to write and talk about his favorite topics every day as a Customer Success and Help Center Content Manager at TrainingPeaks. When he's not helping coaches and athletes learn to leverage technology to reach their goals he's trying to become as good of a mountain bike racer as he was when he was 13 years old.